We love travelling as a family, but with three kids on the road, there are bound to be some travel breakdowns. We had to learn some things the hard way, so I’ve compiled a quick overview on the Do’s and Don’ts of taking your little ones on a trip. I am always looking for good deals and, since I am a bit of a planning bee, we tend to book ahead. You can save a substantial amount on accommodation and travel costs if you keep an eye out for early bird offers and discounts. This is especially important for larger families, as costs can quickly add up. Also, booking ahead of time ensures you can find the best accommodation for a large family – you will be able to pick what you really want rather than frantically having to book just anything because it’s the only place that’s large enough and available. Obsess, don’t stress. It’s important to have the whole trip sorted before you set off, because you will be dealing with hunger, thirst, boredom and the cry for a loo before even spending five minutes on the road. There are some simple things you can do, like keeping a list of available rest places on the road. Or, if you are flying, instead of driving around the airport car parks in search of a space with three grumpy children at the back, you could book a Meet and Greet service that will park your car for you. Over at Looking4Parking.com, you can search for different parking options at all the major airports around the world (they also offer cheap parking deals if you just want to save as much as possible). We all know the dreaded five words: “Are we nearly there yet?“ (usually uttered right after departure). So always pack in some entertainment for your little ones. A tablet seems to be a popular choice these days; we use it mainly for films and educational games. Think about “off-screen” options, too, if you want to limit screen time. You know what your kids like best, but for us sticker and colouring books, and various games work very well. Yes, you just had breakfast, but soon one of the kids will pipe up “Mum, I’m hungry”. For this type of emergency, you need a back-up plan, preferably one that includes healthy snacks in your rucksack. Something like a cereal bar, fresh fruit or some nuts usually manage to hold food-related grumpiness at bay. When on the road, make sure your rucksack is not buried underneath all the other luggage and when at your destination, don’t forget to re-fill it daily. 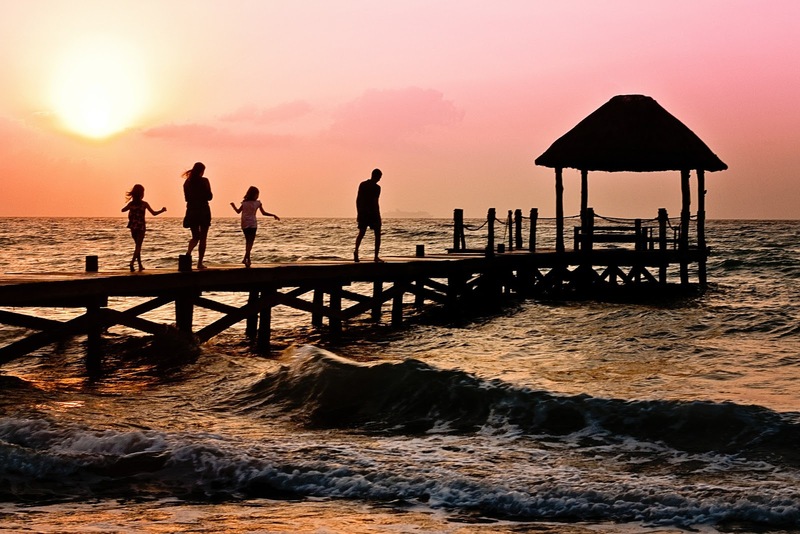 Going on holiday with your parents or the in-laws (or both) can save everyone a lot of hassle. Especially large families often face the problem of parents being outnumbered by their little rascals. If you get two more pairs of eyes on board, looking after the kids will be much easier. Grandparents love to spend time with their grandchildren, so you and your partner will probably manage to have some time off parenting now and again, which is an added bonus. 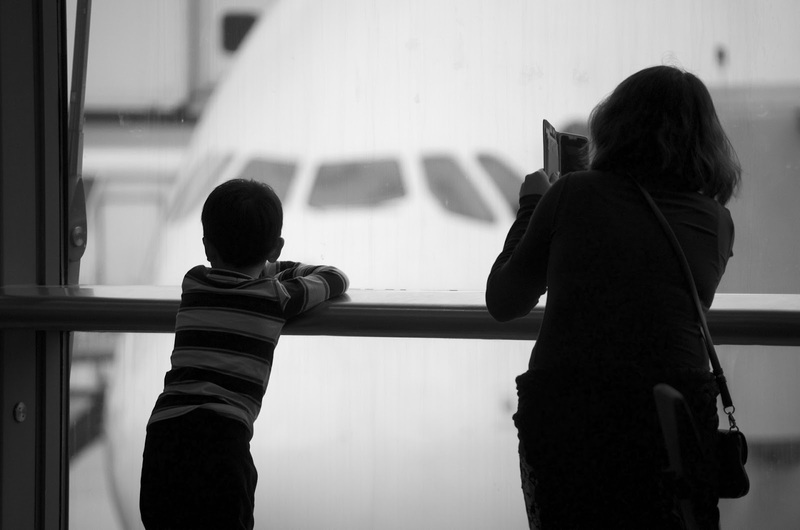 Don’t put off travelling with young children until they are older. It’s best if they get used to being outside the house and their routine as soon as possible. There are new challenges when travelling with babies and toddlers, but the sooner babies get used to travelling, the easier it will be for everyone in future trips. You might have a lengthy list of things you want the kids to see, but don’t rush them or they (and you) won’t be able to appreciate your holiday. Take your time to really enjoy your time together and each of your stops. Don’t rush to each destination without breaks, as you can make the trip itself memorable by planning in some interesting stops for both children and adults alike. A while back we got it wrong. It wasn’t pretty. Of course, with toddlers you can’t always be 100% sure it’s safe to get on the road again, but anything you can do to avoid the mess, do it. Starting potty training a few weeks before your next trip and packing a few more nappies could save you from having to stop every five minutes. As seasoned travellers, we’ve had our fair share of mishaps (if I’m honest, I think they’ll always be happening). Even after all the planning, the various experiences and the extra caution, there will always be an element of surprise when travelling with children. So, as a final piece of advice, let me tell you – DON’T stress over it!